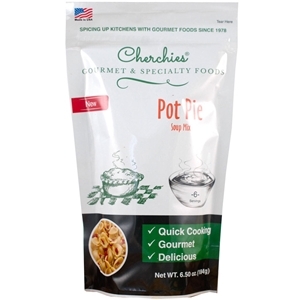 Cherchies Pot Pie Soup is one of our best selling products, and it now comes with a new look! With its rich homemade flavor, orecchiette pasta, vegetables and a very tasty seasoning all in one bag, their pot pie soup is nourishing and delicious. It is a "quick cooking" comfort food. Add your favorite meat and serve it year-round for a truly satisfying meal. Makes approximately 6 (1 cup) servings. 7.10 oz. Add entire contents of soup package to 6 1/2 cups boiling water. Reduce heat, cover and simmer for 20 minutes. After 20 minutes, stir in the cooked meat and the onion/garlic mixture to the soup pot. Bring to a boil, then immediately reduce heat to low. Cover and simmer an additional 10 minutes. Optional: Make biscuit mix dumplings, using a package mix such as Bisquick®, and spoon them into the cooking pot after the chicken and sauteed mixture have been added to the pot. Ingredients: Orecchiette pasta (duram semolina flour, eggs), dehydrated vegetables (onion, red bell pepper, carrot, celery), salt, sugar, hydrolyzed soy protein, garlic, parsley, white pepper, oleoresin turmeric, spice extractives, (silicon dioxide added to prevent caking). Allergens: Contains wheat, eggs, hydrolyzed soy protein. Allergens: Contains wheat, eggs, hydrolyzed soy protein.